(Nanowerk News) Through RNA sequencing, researchers can measure which genes are expressed in each individual cell of a sample. 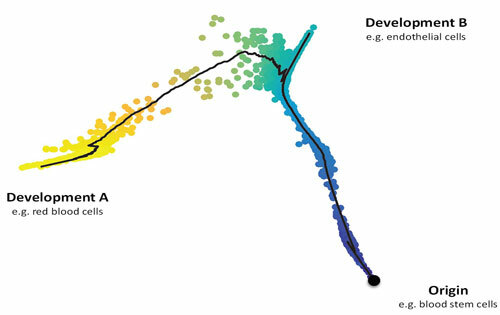 A new statistical method allows researchers to infer different developmental processes from a cell mixture consisting of asynchronous stages. This finding has been published by researchers of Helmholtz Zentrum München in collaboration with colleagues from Technical University Munich in the journal Nature Methods ("Diffusion pseudotime robustly 1 reconstructs lineage branching"). Today, cell biology no longer focuses only on static states, but rather seeks to understand the dynamic development of cells. One example for this is the formation of various types of blood cells, such as red blood cells or endothelial cells from their precursors, the blood stem cells. To understand how this process is genetically controlled, scientists analyze which genes are expressed by means of transcriptome analysis. To decrypt developmental processes from the measurement of a single time point, quasi a snapshot measurement, the researchers led by ICB Director Prof. Dr. Dr. Fabian Theis developed an algorithm called diffusion pseudotime to interpret single cell sequencing data. This algorithm orders cells on a virtual timeline – the pseudotime – along which they show continuous changes in the transcriptome. Thus, it can be reconstructed which genes are expressed sequentially. By means of this method, researchers can graphically display the branching lineages of the developmental paths of different cell types. “For example, we can show how a relatively uniform cluster of blood stem cells develops into different cell types,” said study leader Theis. “While some become red blood cells, others differentiate into endothelial cells. We can trace these fates based on the transcriptome data of the single cells.” In addition, the scientists obtain information about which gene switches underlie the developments. The relatively diffuse mixture of cells which were found to be at different stages of their development can be disentangled on the computer and, after the analysis, provides a clear picture of the ongoing individual steps. *RNA stands for ribonucleic acids which make up the raw material for the transcriptome analyses. ** In collaboration with experimental institutes at Helmholtz Zentrum München, the scientists are focusing on the development of brain cells and the insulin-producing beta cells in the pancreas, among other research projects. They hope that by elucidating the formation of individual cell groups, they will develop approaches to intervene in these processes – for example, when they are disturbed due to disease.